The SeceuroShield 3801 provides a strong secure fitting to ensure your goods stay within the property and criminals are kept out. It has a strong secure foundation and is supplied with either a lock in the bottom slat or a pair of bullet locks attached to the guide rails The SeceuroShield 3801 is an Insurance Approved design by SWS. Approval has been gained as a result of independent testing to Loss Prevention Standard (LPS) 1175 Security Rating Classification 1. 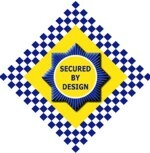 As a further reinforcement of the products performance, the SeceuroGuard 1001 retractable security gate has successfully undergone Secured by Design evaluation and is able to display the “Police Preferred Specification” mark. Secured by Design identifies technical standards and evaluations which test the competence of security products and their resistance to criminal attack. The tests and evaluations are carried out by UKAS approved test houses. Construction: Roll formed aluminium in two sections; top and bottom boxes. Bottom box removable for installation and maintenance and chamfered at 45°. 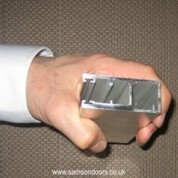 Box Ends: The shutter box is assembled on steel endplates. Guide Rails: Each guide rail must have a minimum of 5 fixings per guide rail (irrespective : of size). The minimum required fasteners are No.12 x 2 ½ “ screws and plugs for masonry and M8 fasteners with 10mm engagement for steel. 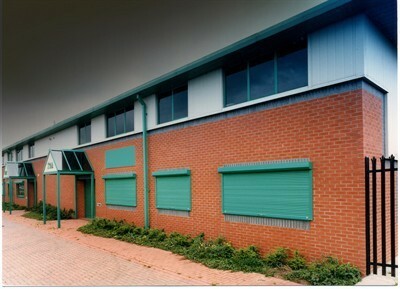 Shutterbox: The shutterbox is fixed at each end and 1000mm centres if over 2000mm wide. A minimum of 2 fixings per end plate are required.